It’s Day 31, which means we’re ending this year’s 31 Days of Horror with the most recently released film on our list, The Visit!! 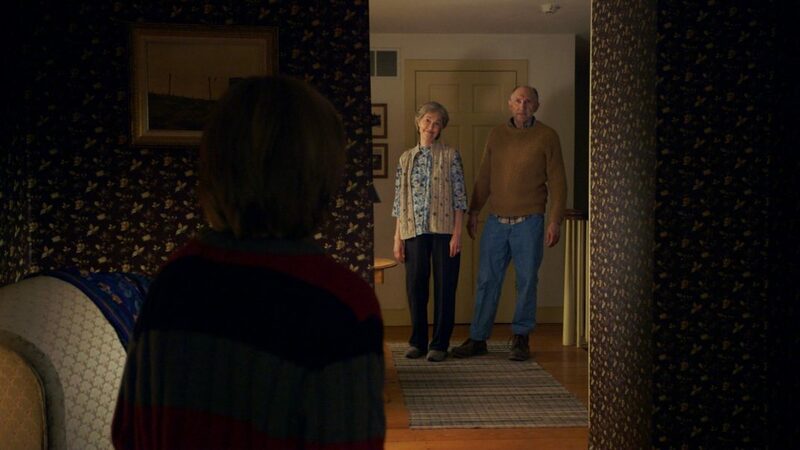 Many of you may not know this, but The Visit is an M. Night Shyamalan film. I imagine when I say his name, there’s a good chance you’re rolling your eyes and thinking back on some of his… shall we say… lesser films, but the truth of the matter is that he is a great filmmaker. When you’ve got The Sixth Sense, Unbreakable, and Signs as back-to-back-to-back films you’ve created on your résumé, you’re clearly doing something right. It’s a shame that he’s taken such a beating recently (so much so that Sony buried his name in all the marketing for After Earth), but I believe The Visit (which was created under Blumhouse) is a return to form for him and should hopefully win him back the respect he deserves. If you read my review for [Rec], you know my contempt for “found footage” movies. I realized after I wrote it that I actually have enjoyed a few, if I’m being completely honest. I think the Paranormal Activity movies have been pretty great, and I even liked V/H/S and Creep, so the genre CAN work on me. And it did for The Visit, as I didn’t find myself annoyed with the gimmicky approach at all and was genuinely creeped out in quite a few scenes. It’s basically about a brother and sister who go to spend a week with their grandparents. That may sound perfectly normal, but they’ve never actually met their grandparents, so they have no idea what they look like. Years ago, their mother had a falling out with them and she left home, ever looking back. Despite that, everything is good… at first. As the days pass, however, they notice their grandparents doing strange things, especially after 9:30pm each night. Despite multiple warnings about being in bed before that time, the two never are as their curiosity gets the better of them. Eventually, they think their grandparents might even be trying to kill him!! Oh no!!!!!! What I like most about this movie is how, despite a very straightforward premise where something is obviously wrong, it doesn’t quite play out like you think it should. It also pushes the boundaries of the PG-13 ratings system, and not even with gore, but with disturbing subject matter. I think that has a lot to do with M. Night Shyamalan’s “classic” directing sensibilities (and maybe also because his goriest film to date, The Happening, happened to be one of his worst ones. It is his only R-rated film, too, so I’m sure that factors in). It seems like he has always tried to be this generation’s Hitchcock, especially by doing cameos in his films, but he certainly does know how to ratchet up the suspense in each scene and then let it play out at its own pace. And that definitely works for this movie. It’s a mystery throughout, but some of the creepiest scenes actually happen early on (like the grandmother eerily chasing after them in the crawlspace). By the time all is revealed, it certainly feels earned and isn’t cheap at all (even if my wife and I saw it coming… something our friend Toby did not), and that’s saying a lot for a film these days. I’m actually really excited to see how he will approach Split now. All of that’s not to say this is a perfect film, however, as there were a few goofy moments here and there (namely the main kid rapping in the film, and then doing an extended rap during the credits), but it can be easily forgiven because the film is so good in other areas. Overall, it just works. Well, that just about does it for this year’s 31 Days of Horror. We sincerely hope that you’ve enjoyed our picks and have expanded your horror cinema knowledge by watching our overview videos. I know we’ve had a blast!! So, on behalf of all of us here at It’s Just Awesome DOT com, we’d like to say thanks and… HAPPY HALLOWEEN!!!!!!!!! !